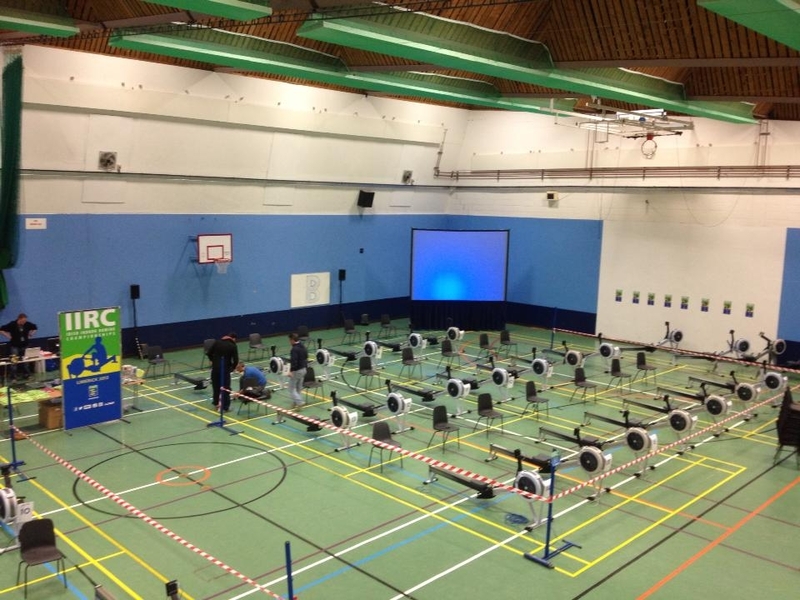 Our gym has a fleet of Concept 2 rowing machines (ergos) widely considered to be the best exercise machine in the world. Rowers at National and International level spend between 20% and 40% of their annual training time on ergos, so if it is good enough for them it is for you too! Indoor rowing machines have been around for nearly 140 years. Since the 1960s they have been used in the coaching of rowers as they give an accurate measure of the force a rower can generate and also their level of fitness. Several different types of rowers have been developed but it was the adoption of the Concept2 as the standard machine by the rowing community that allowed the accurate comparison of individuals and also the start of Indoor Rowing as a competitive sport. The gym at DARC has 15 Concept 2 ergometers and provides an ideal environment in which to train. There is also one Row Perfect machine. Indoor rowing is a great way to get fit, maintain fitness or lose weight and it is not just for rowers, ergos are used by top athletes in many other sports because they provide a low impact but intense, whole body workout. As with any exercise it is important to build up gradually and take time to develop good technique. The mirrors in the gym are really useful for this and you should watch yourself both from the side and the front. Place the handle in the handle hook, adjust the footrest height and secure your feet. Always go through a warm up before starting to exercise, the length of the warm up depends of how intense the training session is going to be. So for a low intensity session the warm up should be between 5 and 8 minutes but for an intense session, for example a 2k test the warm up should be between 15 and 20 minutes. Stretch after the warm up before starting your session. After completing the session always make a note from the monitor memory of what you have achieved, a training log really helps you to set realistic goals and plan your training and so improve your performance. Cool down on the ergo for 5 minutes and then stretch again. Replace the handle back to the rest position, against the monitor support; this reduces the strain on the shock cord. It is really beyond the scope of this short piece to go into details of technique but there are photos in the gym of common faults and many books which can give far more detail about technique. The best books to refer to are ‘Indoor Rowing Training Guide’ by Concept2 and can be purchased or referred to on their website ‘www.concept2.co.uk’ and ‘The Complete Guide to Indoor Rowing ‘ by Jim Flood and Charles Simpson. Start from backstops with your legs straight, leaning back slightly and the handle drawn into your body and your forearms parallel to the floor. Extend your arms away from your body so they are straight. Rock your body over from the hips. Only once the hands have gone over your knees and your body is fully rocked over do you allow your knees to bend and the seat moves forward, you must maintain straight arms and the rocked forward body position. Once you reach the front of the slide your shins should be vertical, your body pressed up against your thighs and your arms straight and relaxed. As the legs push further back the body position opens levering the arms back but keeping them straight. Once you have got the sequence you need to be able to follow it with an easy, relaxed rhythm, only taking the rate and power up once you have mastered the correct technique. The most important thing to remember is that the power comes from the push with the legs, the leg drive, not the pull of the arms. The programmes are really good, with plenty of variety in the types of sessions so far less boring so helping with motivation, it is well worth logging on to the site. Indoor races are generally, but not exclusively, held over a distance of 2,000m or 2k. There are often some team races and 500m sprint races too, but it is the 2k which is seen as the ‘Blue Riband’ event. 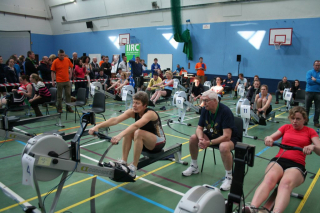 The biggest indoor event in this country, with the best competition and a large entry, is BIRC (British Indoor Rowing Championships) which used to be held in November at the NIA in Birmingham, though a lack of funding led to a change of both date and venue. 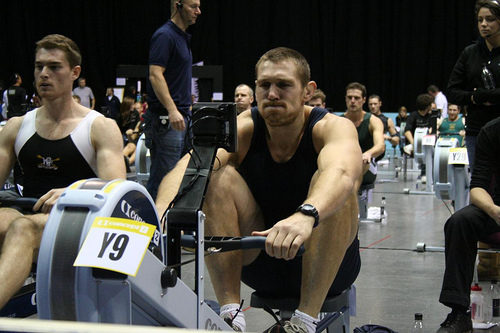 The inaugural British Rowing Indoor Championships took place in London in February 2015 and now takes place annually in December at the same venue. The World Championships are held in February in Boston, USA. There are plenty of smaller races including the National Championships (English, Scottish. Welsh, Irish) and the easiest event to get to is the North East Indoor Championships held at Maiden Castle, Durham, usually on the first Wednesday in December. Details of all these events and many more can be found on the Indoor Sports Services website. Entering is easy; it’s the race that’s tough! In these events you can have anywhere from 10 to more than 100 race machines, there are always warm up machines provided and it is essential to warm up for at least 20 minutes before you race. In the warm up you need to do burst of 10 strokes at max pressure to get your heart ready for the race. You can set the Drag Factor to your preferred level. The monitor on the race machine gives you plenty of information, your 500m splits, the distance you still have to go, your rate in strokes per minute and an idea of where you are in the race. The most important thing is to pace yourself. Garath used to play rugby for Newcastle Falcons and England (1996-2000), after he retired in 2004 he came to DARC and was interested in competing both on and off the water. He was coached by Geoff Graham and in his first year of competition (2008) he won the 30-34 Men’s Open at BIRC in a time of 5m 54.3s and the following year (2009) he entered the Men’s Open, racing the whole of the GB rowing squad and winning with a personal best time of 5m 51.1s. This really was a tremendous achievement and a first for DARC. Gill took up rowing at the age of 49 and never thought of competing in Indoor races, but training in a quad led to several ergo sessions and coach, Geoff Graham, felt her times were worth entering BIRC, she competed for the first time in 2006 when she won the 45-49 Women’s Open with a time of 7m 17.8s and won her age category every year until 2015. 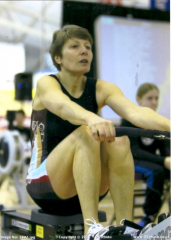 In 2007 she travelled to Dresden, Germany and won the European Indoor Rowing Championships and in 2008 she went to Boston, USA for the World Championships which she also won. In 2013 Gill raced in the English Indoor Championships and set a new World Record for the 55-59 age category. She went on to break her own World Record in 2014 with a time of 7m 20.1s. Her personal best was set at the English Indoors in 2007 and was 7m 15.6s. 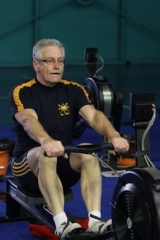 Roger took up rowing in 2005 shortly after his 60th birthday and quickly established himself on the indoor masters scene, regularly entering British, European and World Championships and winning gold in the over-60 age category at the Irish Championships in 2007 before setting his personal best time for 2km of 7m 04.8s at the 2009 British Championships. On reaching 70 he set about establishing records in the over-70 category, achieving a British record of 3m 23.5s for 1000 metres at the Scottish Indoor Championships in 2014, closely followed by an Irish Allcomers record of 7m 11.8s set in Limerick and a British record of 7m 08.7s over 2k at the British Rowing Championships in February 2015.